Holding a big event could be a little too much for some us especially if we are low on our finances. 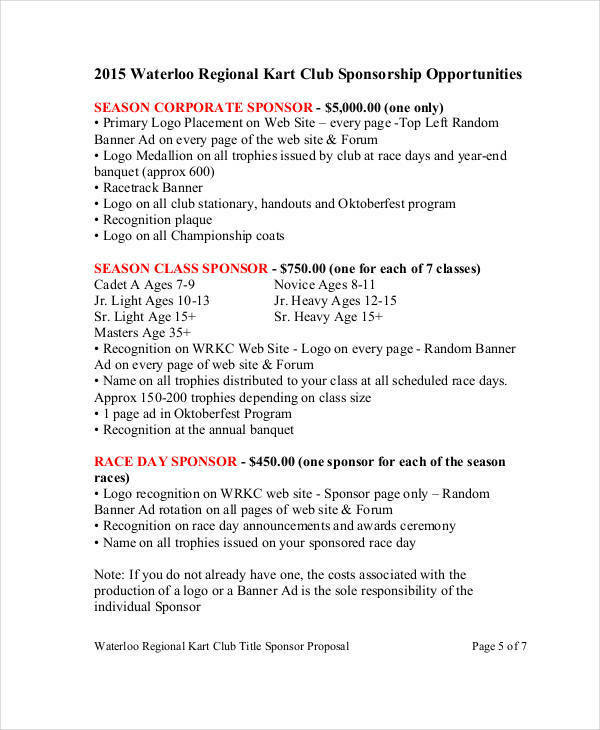 So what most of us do is to get some sponsors for the event. We want it to be a success so we resort to this option. 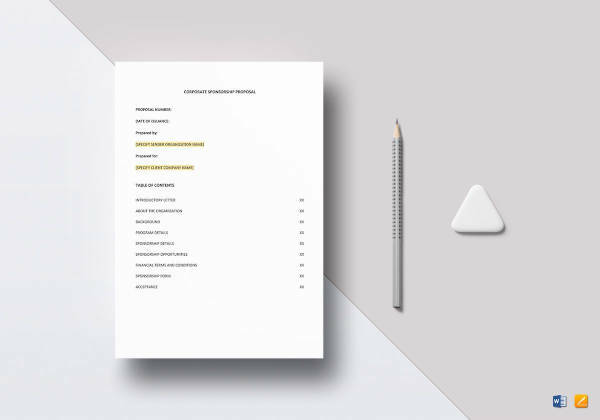 What most of us don’t know is that most companies or people in the management report want their names or brands be within the reach of the consumers. 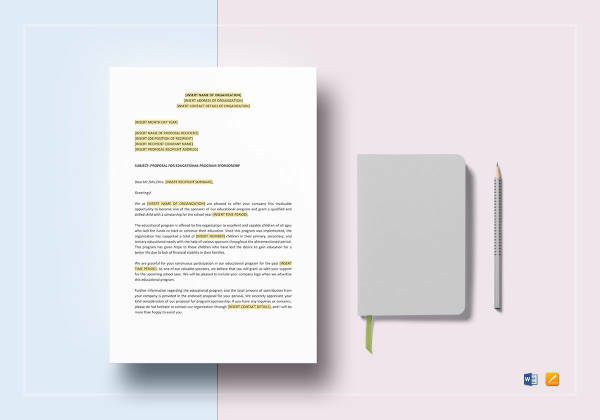 Writing a proposal could be a critical job. Why? 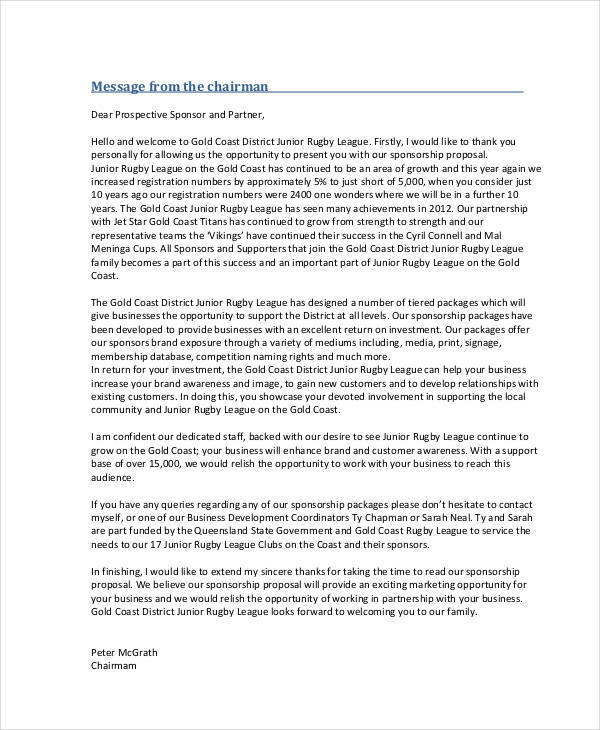 Because the acquisition of a sponsor depends on it. 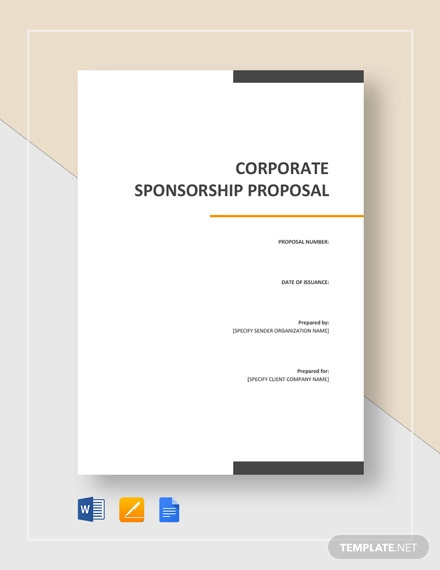 Although in most cases, a part of a company’s marketing plan is to sponsor an event, it is still a prerogative to write an appealing proposal. 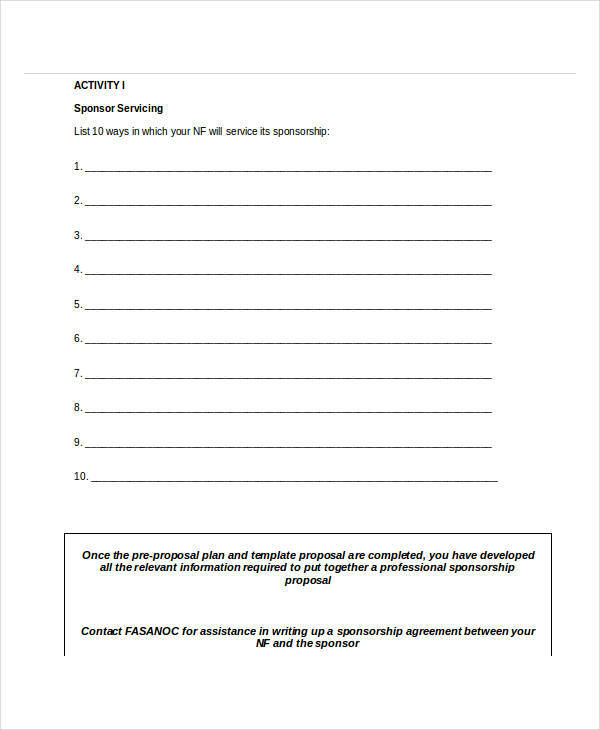 There are a lot out there hunting for sponsors and you don’t want to be behind them. 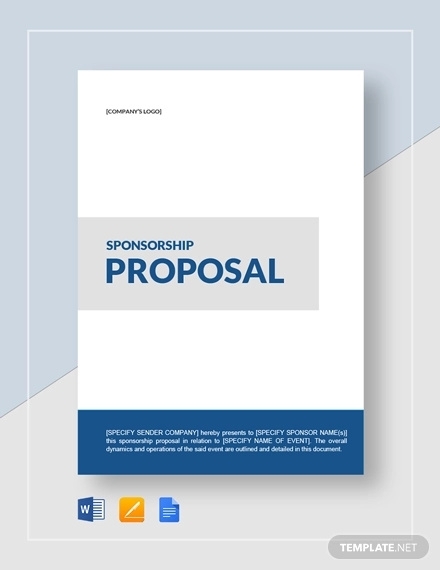 A sponsorship proposal is a written letter that is drafted with the sole purpose of having a certain company or someone with the financial capacity to be a part of an event. Being part of an event doesn’t literally mean they show up and do something on the occasion. It simply means their presence should be felt in the event. 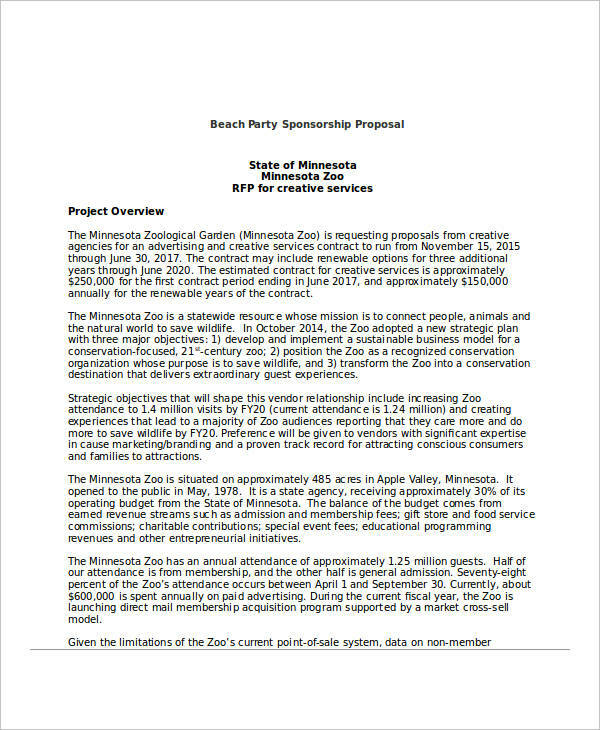 A sponsorship benefits two parties. 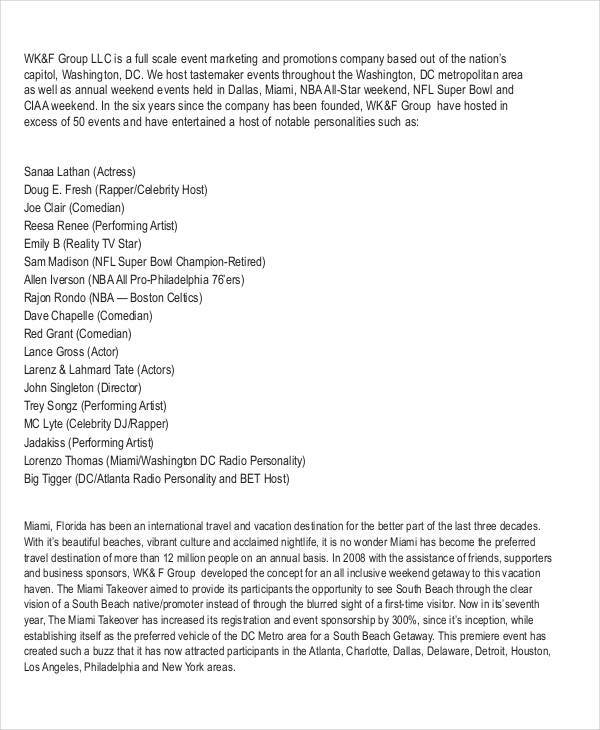 First is the host of the event. 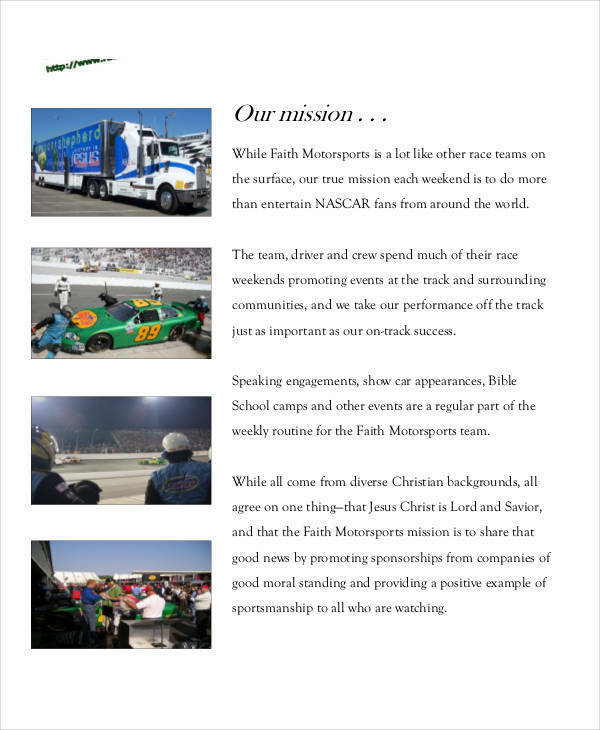 Financial help is mostly what sponsors offer and that is exactly what hosts need. 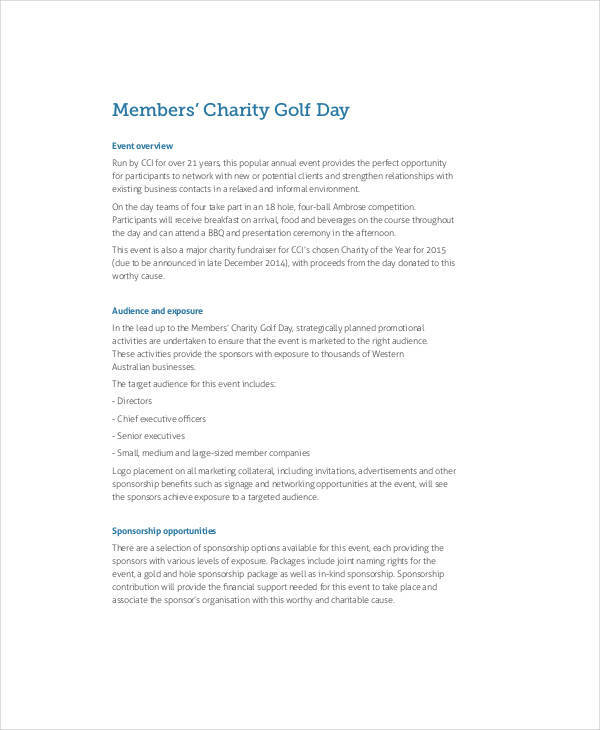 Big events such as charity and sports require a lot of money to be used in a lot of ways. From the event posters, to the manpower need, and even to the prizes which most events have, are all covered in the allotment of the finances. 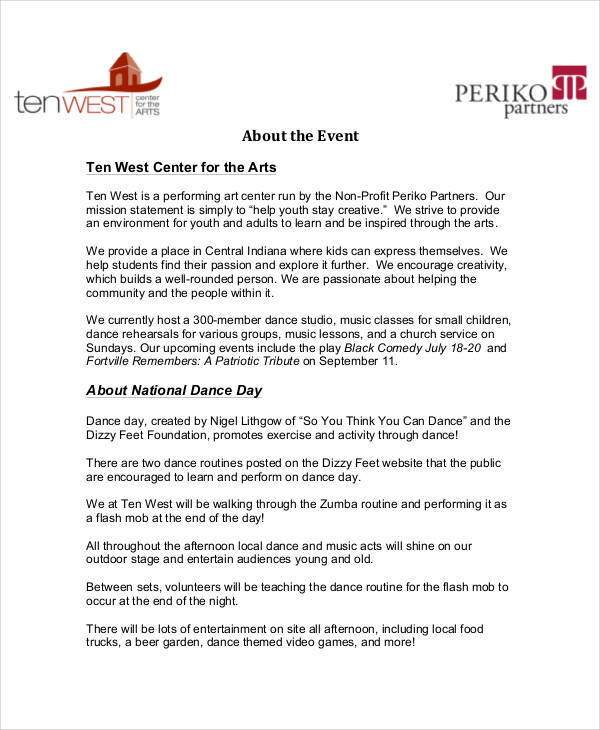 The host of the event would resort to a multitude of options just so the event could be a success. On the other hand, big companies want their names to be recognized on every occasion, whether small or big, for their own benefit. 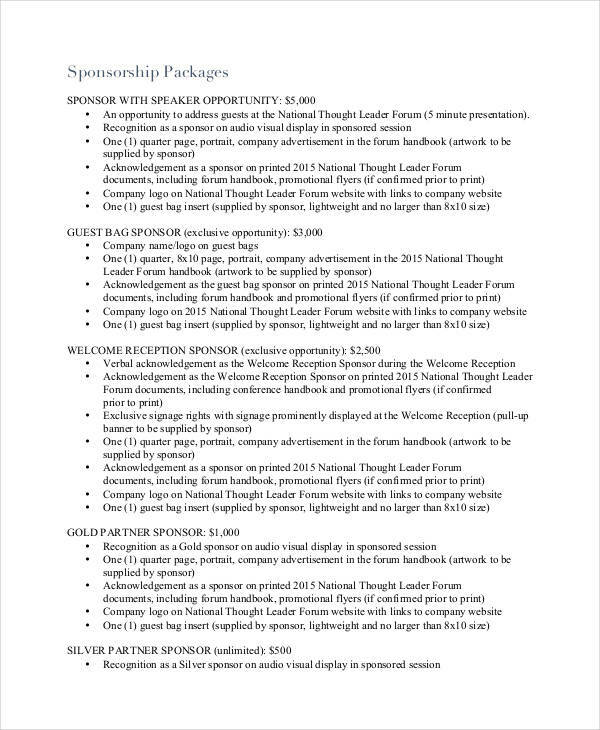 So what they do is they become one of the sponsors of an event. 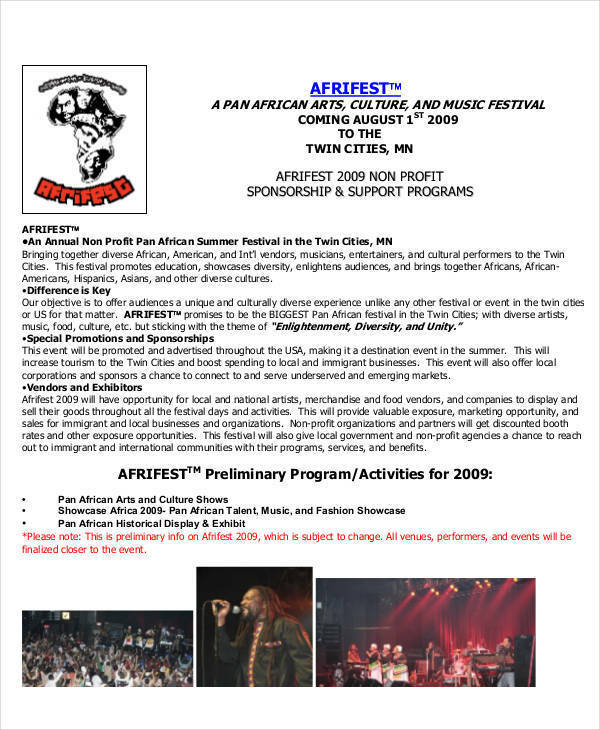 They want their names and company logos to appear in every banner design and invitation flyer. This adds to their brand recognition and increases the possibility of bigger sales return. 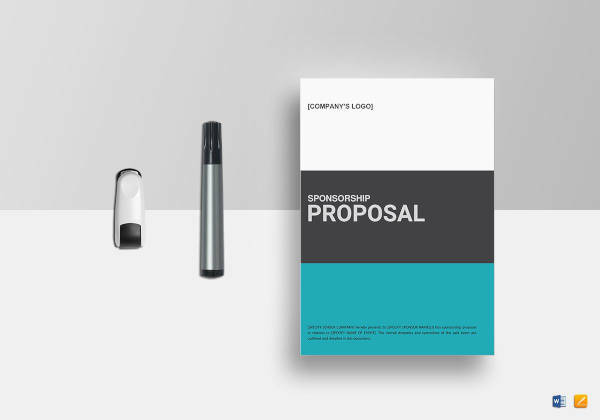 When writing a sponsorship proposal, it is very essential to remember that your main goal is to provide satisfactory reasons why you deserve a sponsorship. Simply stating that you need financial help doesn’t sell. 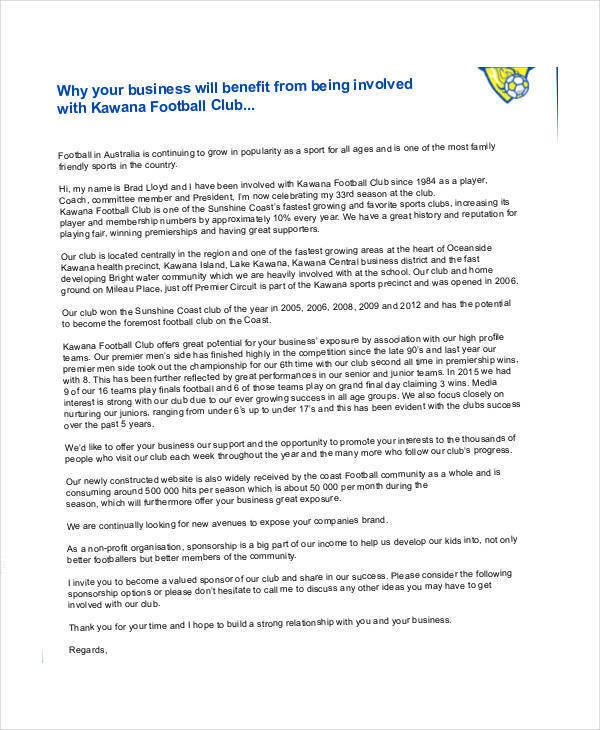 You also need to explicitly state the benefits the sponsor would get in return. 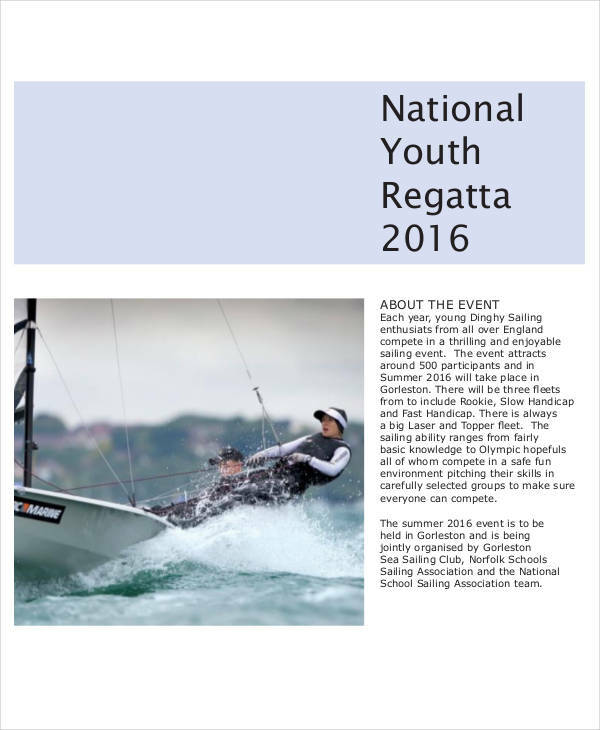 Looking for a sponsor could be a competition among event hosts. 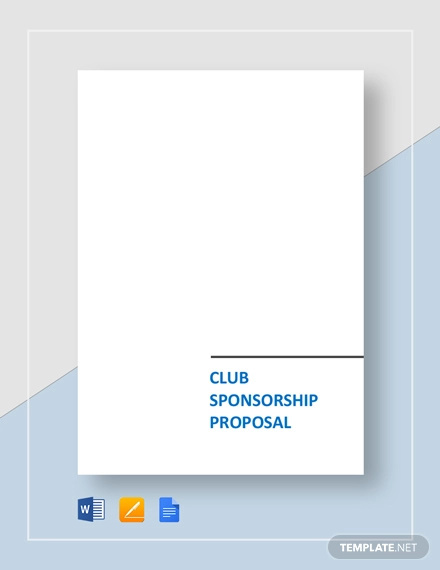 The only way to win it is to write a competitive sponsorship proposal. Take a look at the tips below and see if you can incorporate it in what you do. Know Your Goal. 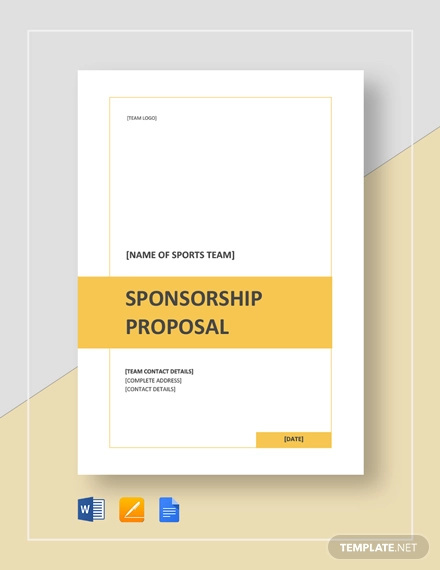 This is the first thing to keep in mind before you write a sponsorship proposal. You have to have a smart goals. And your goal is to get a sponsorship. When you have a goal, it should be easy for you to take the necessary steps to be ahead of the pack. Do a Little Research. It pays to read magazines, online newspapers, and advertising brochures. 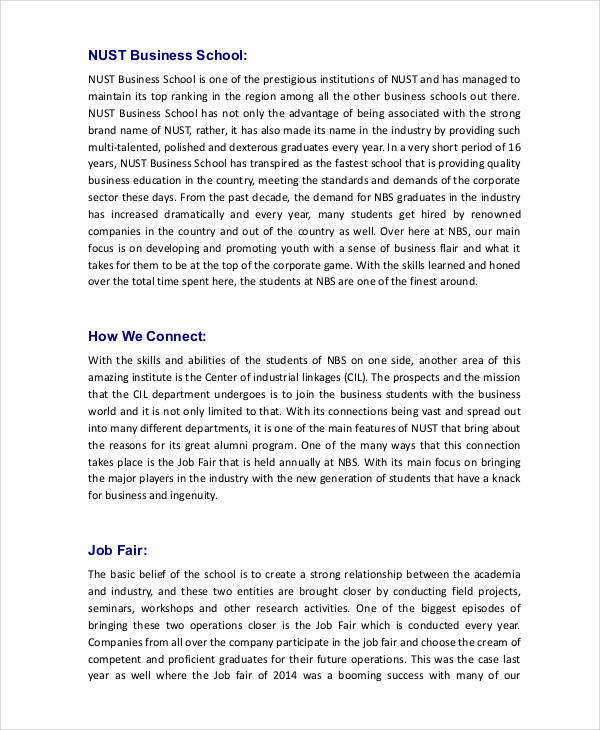 Most companies who appear in this papers love the attention of the media. They want exposures. Make a list of these companies and try to filter it according to the nature of their businesses. 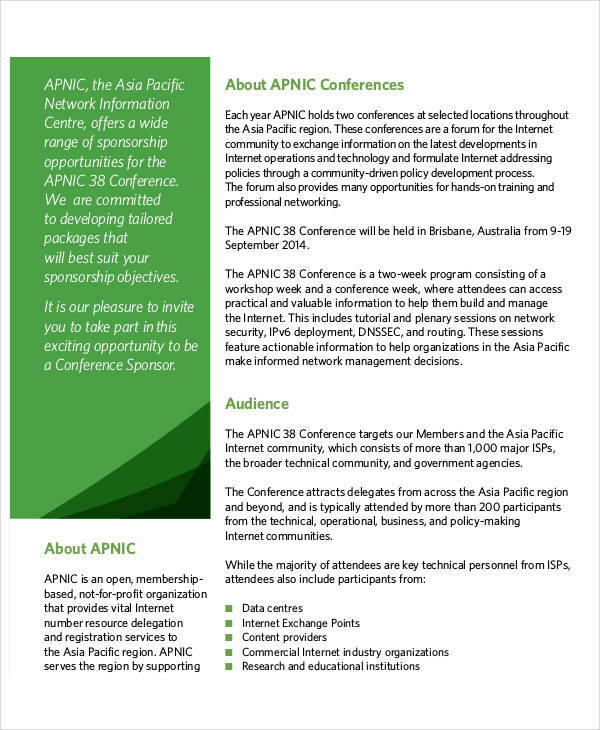 Make sure you are picking the right company for your event. Picking the wrong business could get you into serious trouble in your future dealings. Know What You Need. 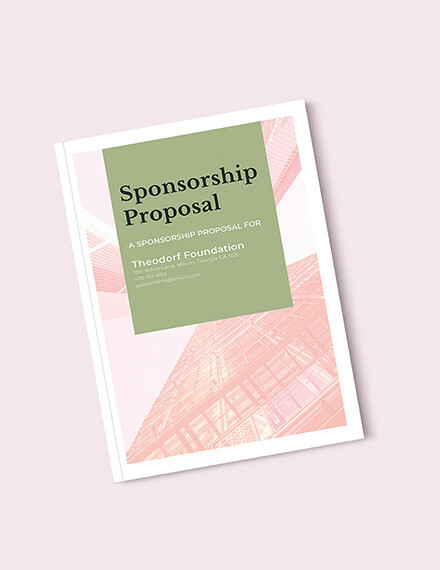 When creating a sponsorship proposal, you have to make sure you know what you are looking for. 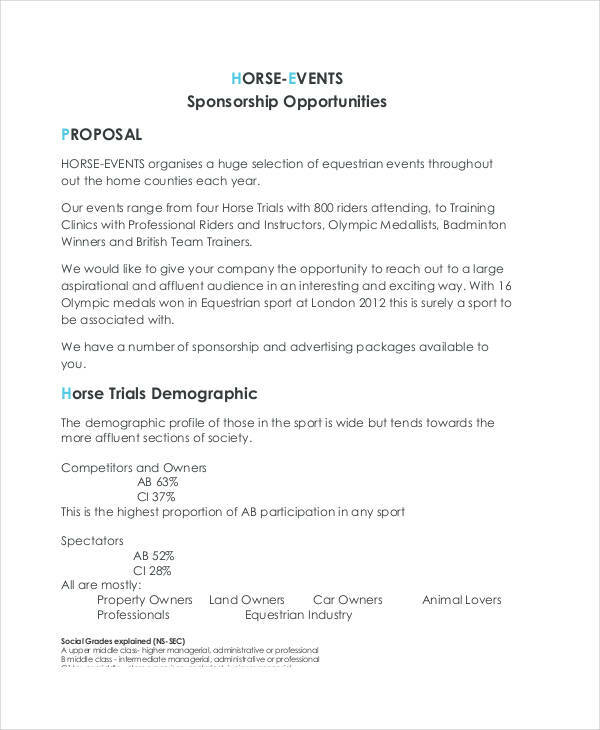 Before you write your proposal example, identify what you need for your event. If you lack finances ask for cash. You can also ask for in-kind donations like what most charitable institutions do. They ask for clothing and foods for their beneficiaries. Or you can simply ask for manpower assistance. 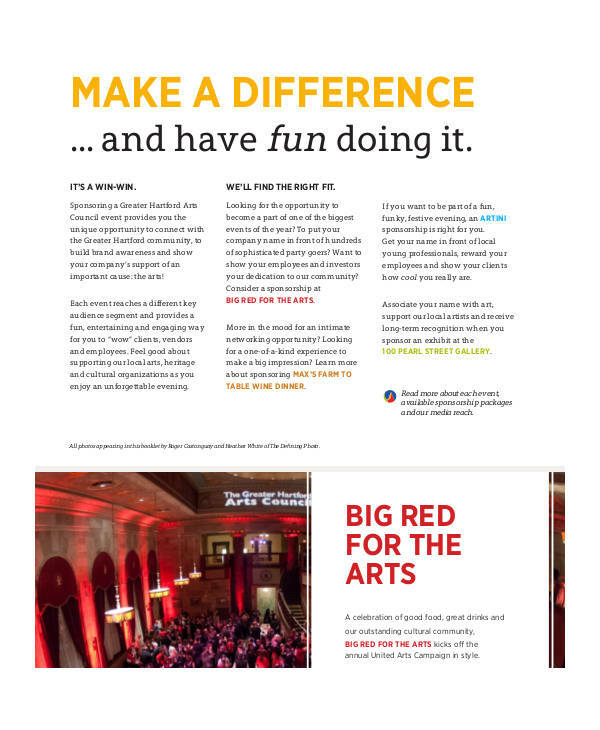 Some companies send their volunteers to be part of an event in behalf of them. Offer the Value. 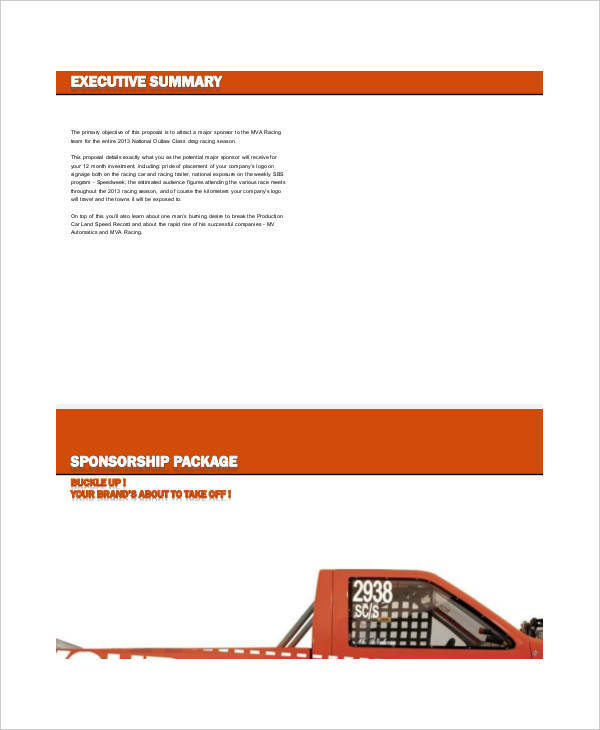 Most, but not all, sponsors focus on their own interest. Never forget about profit. 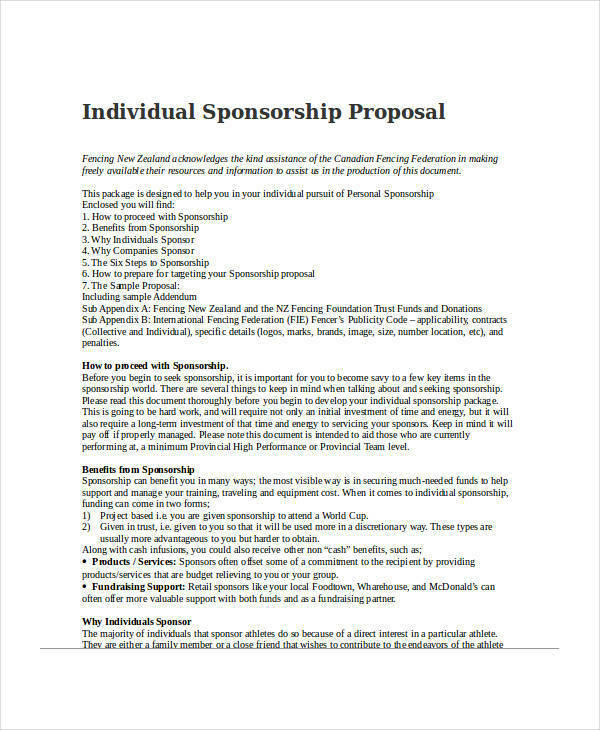 So when looking for a sponsorship, never forget what the benefits the sponsor will get. 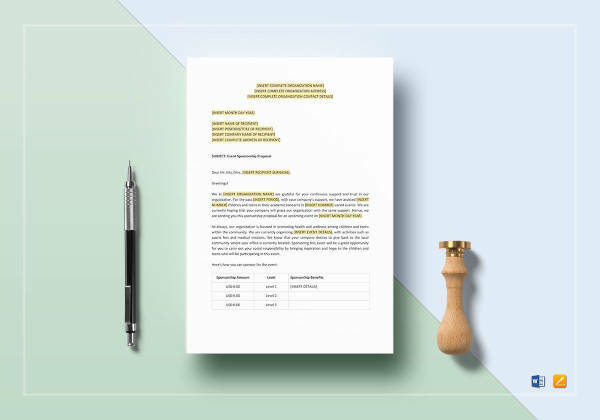 Highlight the important facts and offer it in the best possible way you can. 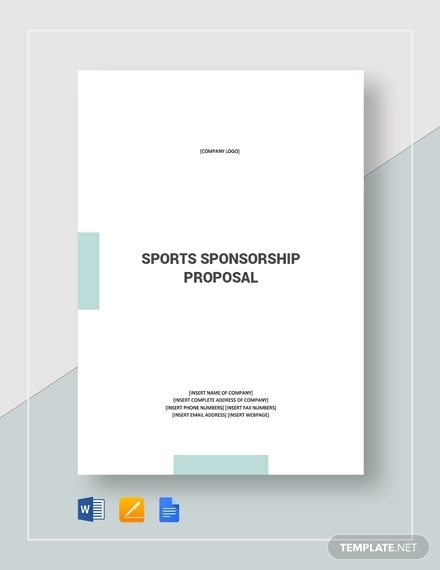 There are a lot of kinds of sponsorship proposals according to the nature of the event. 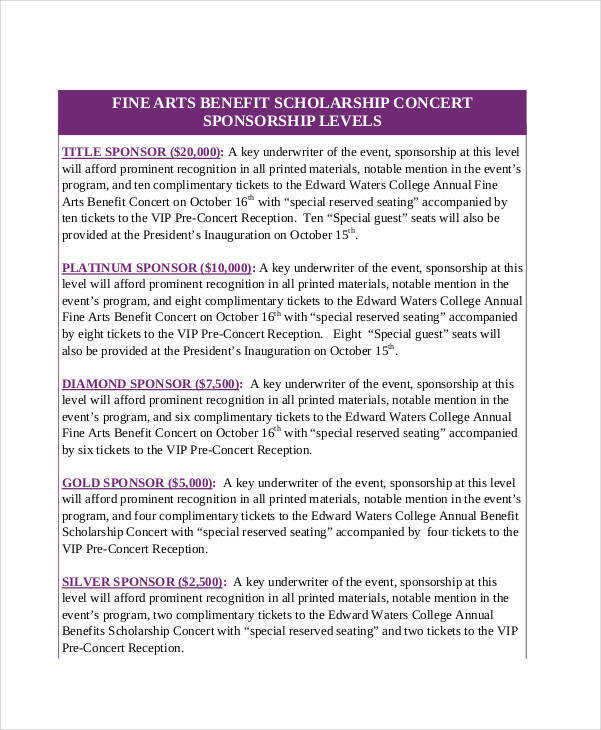 Event Sponsorship. 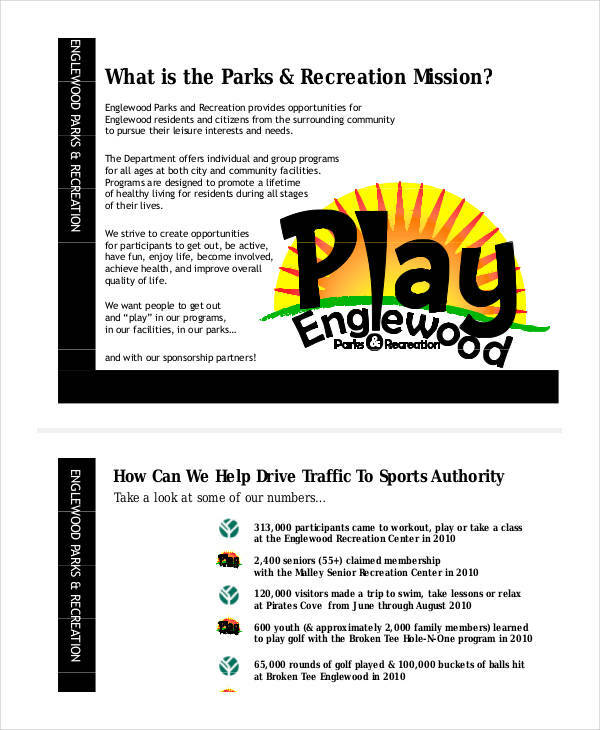 An event could be a charity, sports, or art. 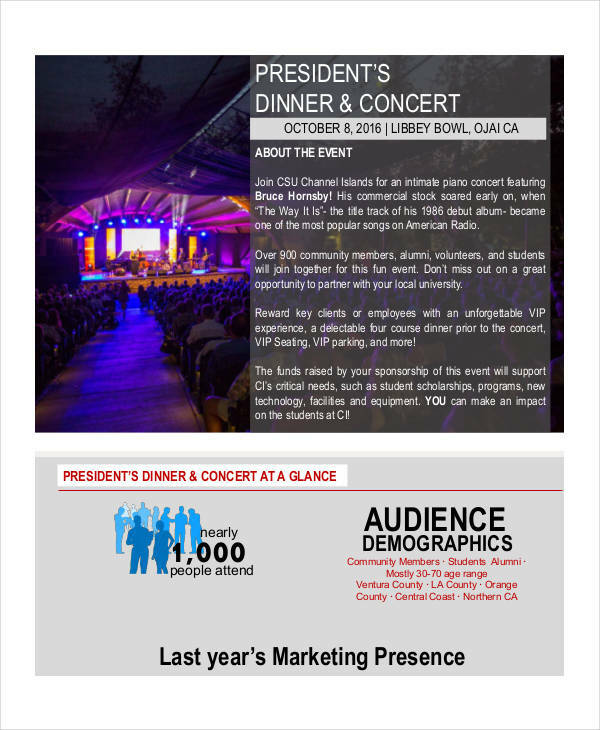 Most common in events is the inclusion of the purpose of the event, who are the audiences, and sponsorship opportunities (even if it’s just to put their logo design everywhere). This is probably the most common because it is so expensive and difficult to hold events. 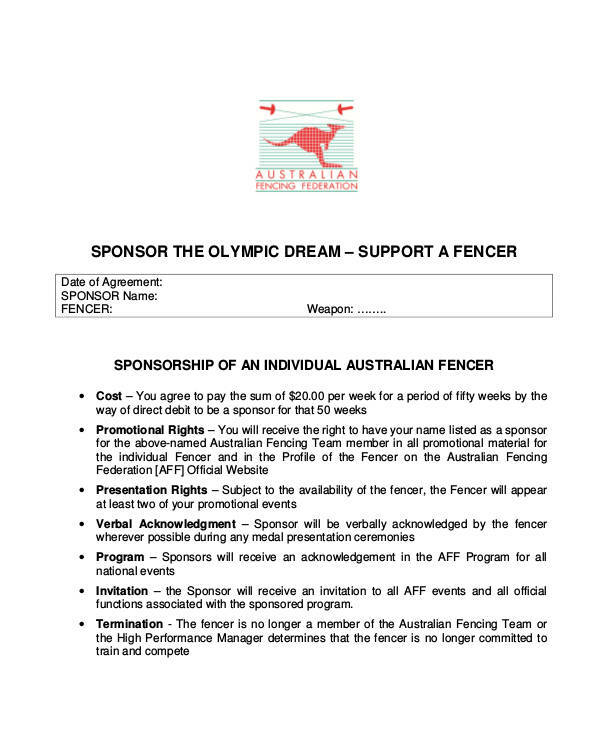 Athlete Sponsorship. 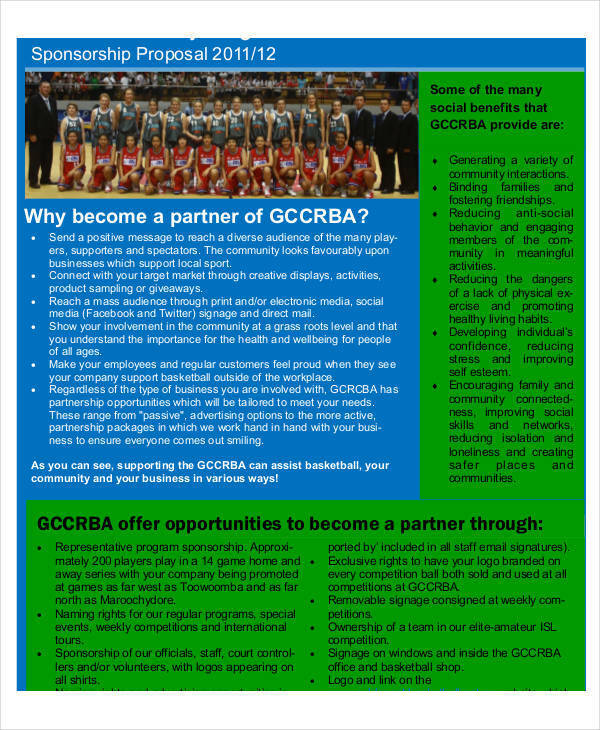 Athletes at the pro level need money for their training, gears, and travel expenses. 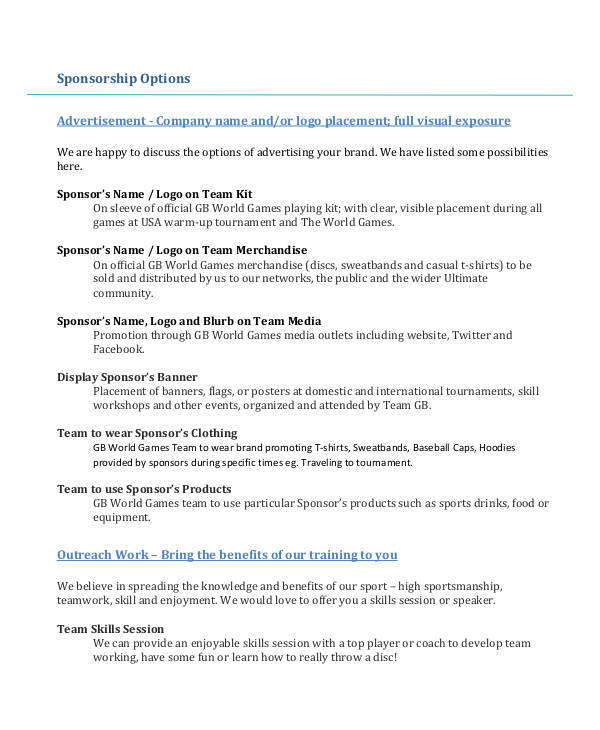 So what they do is look for sponsors who are also sports fans. 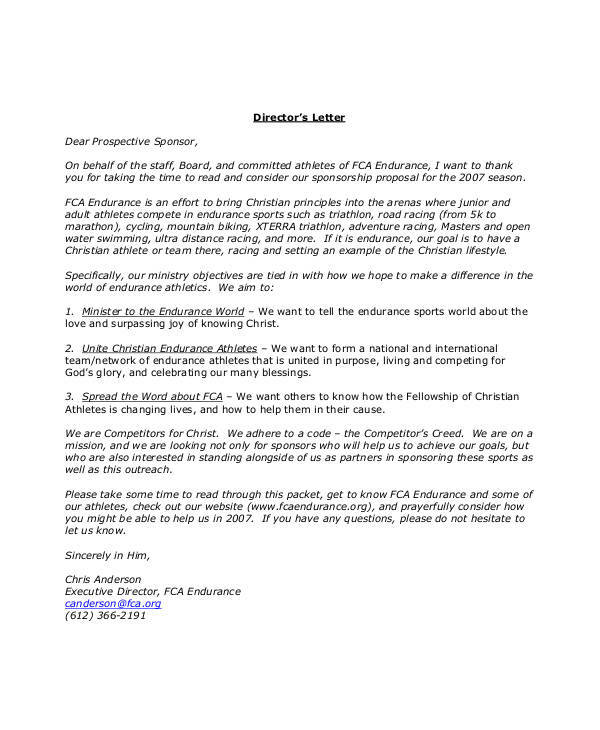 Athlete sponsorship letters are written either by the coach or manager or the athlete. 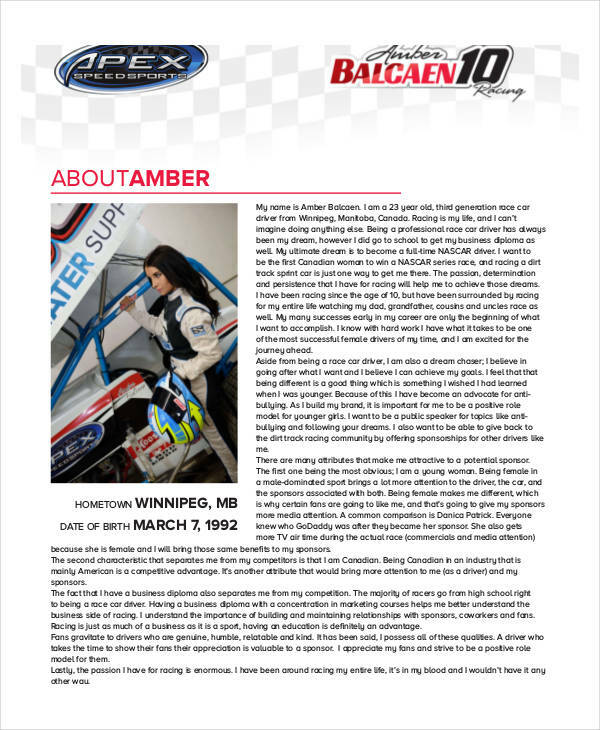 It is a personal statement of their greatest desires to excel in the chosen sport and how they could make their countries proud. Sponsors in return get to have their names on the athlete’s jersey or any sports equipment they use depending on the sponsorship agreement. 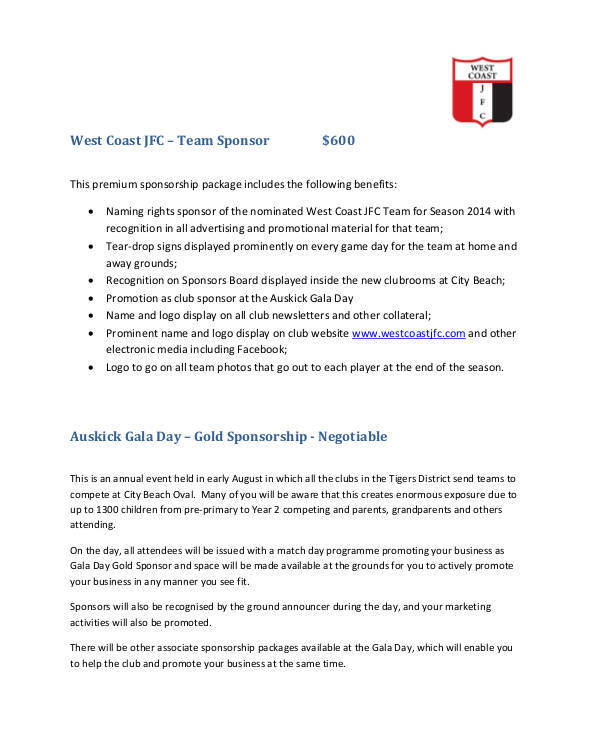 Marketing Sponsorship. This is most common among businesses who would like to invest in some other areas like sports, health, and manufacturing. The usual target market for this are sports teams. 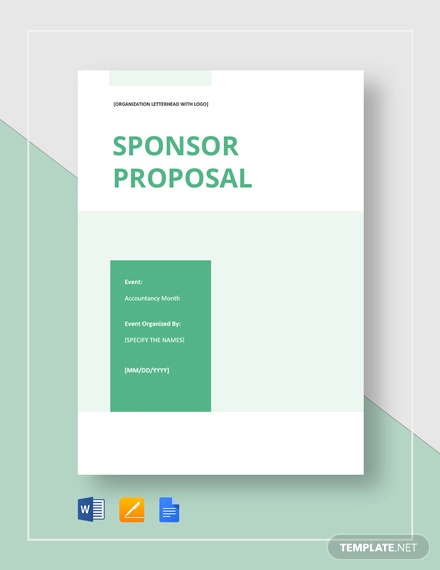 They would offer sponsorships to big companies and in return commits to the growth of their marketing plan by increasing brand awareness to gain consumer trust. 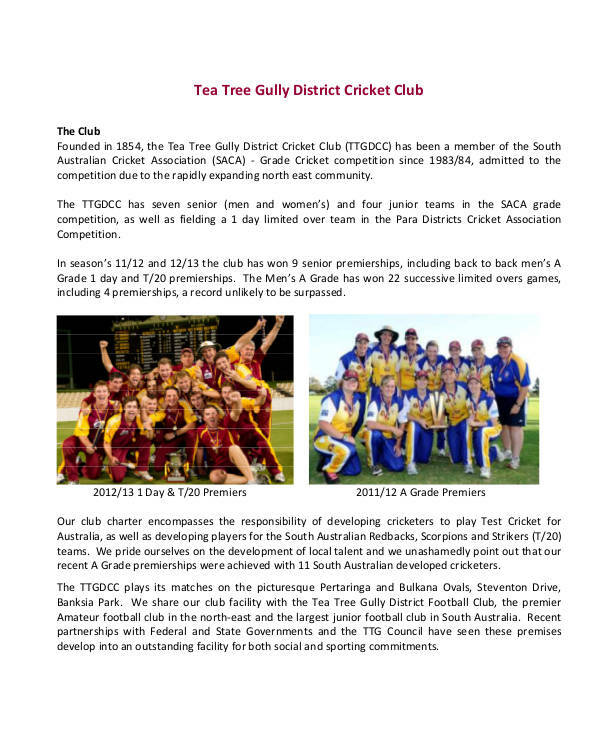 School Sponsorship. This can be categorized in two ways. First is a student school sponsorship. 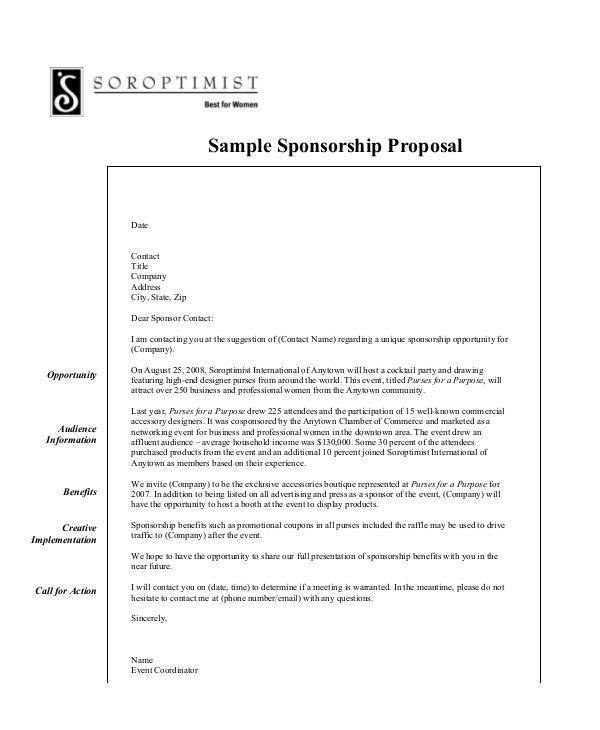 Some students are economically challenged would often resort to looking for sponsors for their studies. They would express their utmost interest in finishing school and in return give back to the communities. 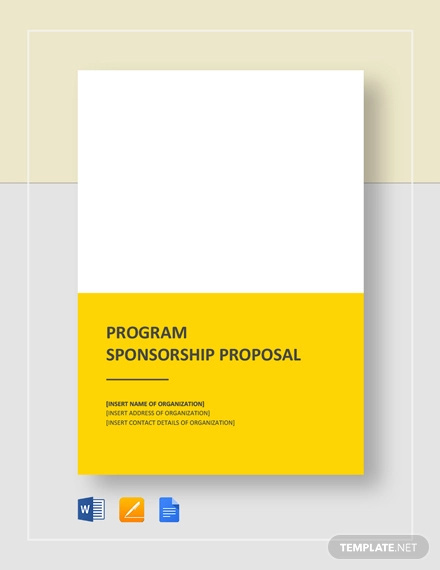 The other one is a school project sponsorship. Here, the school looks for somebody generous to sponsor a school activity. Getting a sponsor to help with your event could be very difficult to some, but when mastered could get you way ahead of others.